We provide inviting places for study and research. Latté in hand (yes, covered drinks are allowed in many spaces! ), you might just find yourself spending a lot of time here. Please see our Food and Drink Policy for details on which library spaces can allow you to bring in a snack or a cup of coffee. The Library Café has healthy snacks and organic fair trade coffee you can enjoy during your study and research sessions at Stauffer Library. Choose from hot and cold beverages, fresh baked goods from the Ban Righ bakery, and more. 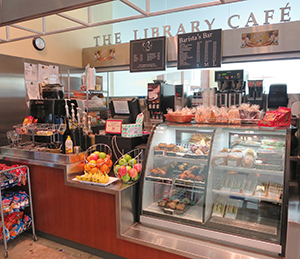 Located downstairs in Botterell Hall, the Market Street Cafe offers hot entrees, feature sandwiches, soups, pizza that you can enjoy in the cafe before you settle in to study at Bracken Library. Please see their website for hours of operation. The newly renovated Jean Royce Dining Hall is located on West campus in Duncan McArthur Hall. They offer meals you can enjoy on-site, and their Barista Bar offers specialty fair-trade coffee, tea and pastries from the Ban Righ bakery. Please see their website for hours of operation.